I hope you all had an amazing holiday weekend. Today I will be going over the final design for Erik's office. This is for the wall to the right of our last concept design. This wall is painted a dark gray as well. Against the wall Erik has two large black bookcases. Here his massive game system collection is displayed. Every shelf holds a different game system and to the side of the game system is a stack of games that go with it. In between the bookcases he has his TV. Currently the TV sits on a dinky little shelf. I would like to get a more sturdy bookcase and get the TV mounted above it. I really liked the look of the this bookcase and love how it is separated for storage. 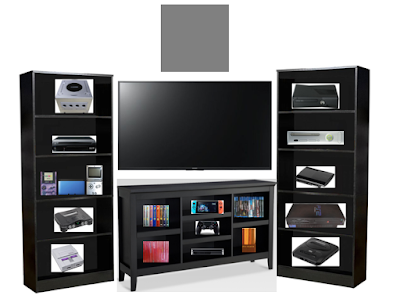 On it we will store the game systems he is currently playing along with his TV series collection. Erik has so much gaming equipment. I think this is a great way to display it without it looking too cluttered. How do you keep all your clutter organized?